I predicted that Kacey and Theo would be the subject of All In while reading Full Tilt. I noticed small things like Kacey thinking Theo fit what she normally would find attractive compared to Jonah and a few things like that, but around the 70% mark when she stopped to ask Theo how he was doing when no one else had I knew that I was right. Of course considering that I struggled with Kacey and her instincts to drink herself into oblivion when things get tough at the beginning of Full Tilt, it's no surprise that I found myself rolling my eyes at where we find her in All In. And so it felt like a bit of a repeat to see her have to work through this same issue but to an even worse extent than before. Theo was the true hero of Full Tilt despite how much I loved Jonah. Theo was solid. He was always, always there for everyone. He was constantly looking out for those in his circle. I loved the loyalty and steadfastness of his character. And that was true in All In as well. Theo's journey was about finding a way to continue to take care of those he loves as well as satisfy his own needs and desires. His dreams of owning his own tattoo shop and the girl that he's fallen in love with. Kacey and Theo have a SLOW building relationship. Theo's feelings have been developing for a lot longer than Kacey's, but Kacey does have a little bit more to work through than Theo does in order to get on the same page. I enjoyed how the slow pace made things feel more authentic. Any faster and Kacey's feelings for Jonah couldn't have been as strong as they were. Yet the gradual development lowered the intensity level for me. Sometimes slow burn makes the pay off even better. Don't get me wrong, I loved the outcome and how things ended up, but I didn't feel the fever to keep reading until I'd read every last page like I did with Full Tilt. One of my frustrations with Full Tilt revolved around the frequency of sexual scenes, I was happy to see that wasn't the case for All In. Yet the language was just as much. -"Accept that which has ended and let go so you can move on. So you may grow. So you may thrive." I very much enjoyed All In. I enjoyed the slow build from the end of Full Tilt to the end of this book. Yet the slow burn didn't hold the intensity for me that book 1 had. I loved Theo the most, yet the emotion just wasn't on the same level for me. All In turns out exactly how I wanted and that means it gets 4 Stars. 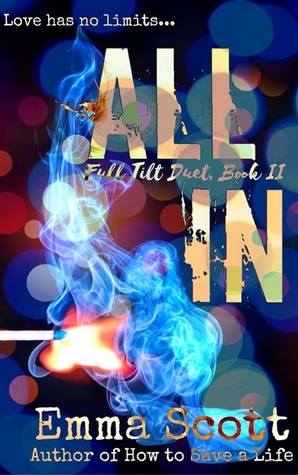 Have you read All In? What did you think? Let me know! Haven't read either book, but I did enjoy your review. Great quote choice too. Aw thanks Sherry! And thanks for commenting!